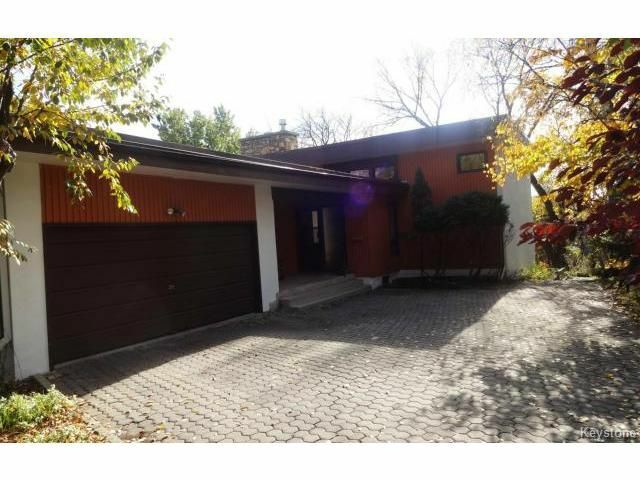 A rare opportunity for a mid-century modern home on the river! Custom designed by International architect Gustavo Da Roza, this house takes full advantage of the natural sunlight and spectacular river views. With 4 spacious bedrooms and two full baths, a huge 50sq ft walk-in master closet, hardwood floors, finished recroom in basement, two wood burning fireplaces, enormous picture windows, vaulted ceilings, double garage, interlocking brick driveway, terraced back yard with deck, garden, fantastic riverine wildlife and much more!. Upgrades include: boiler, piled foundation, roof. This is the one you've been waiting for!! Westwood/Assiniboine River listing expert/specialist!